Longtime Berkeley residents may think they know all about the city's radical past, but outside of the Free Speech Movement and the Vietnam War, the city's protest history is less well known. Thanks to the efforts of two particularly impassioned Berkeley historians, however, that legacy has come to light. More than a decade ago, Barnali Ghosh and Anirvan Chatterjee began documenting the South Asian community's history of protests in Berkeley, and in August 2012, they started the South Asian Radical History Walking Tour. On the tour, on a two-mile trek from Telegraph Avenue to Sproul Plaza to downtown, Ghosh and Chatterjee describe events from more than one hundred years ago — like when sixteen South Asian students at UC Berkeley protested a talk by a Christian evangelist — as well as more recent activism, like the protests at Berkeley High against hate crimes after 9/11. To date, they've given 55 tours to 805 people. Their earnestness and enthusiasm is contagious, and leads newcomers and lifers alike to see their city in a radical new light. 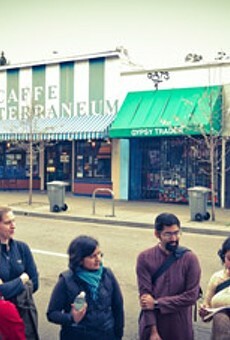 Berkeley walking tour highlights the history of South Asian activism in the Bay Area.